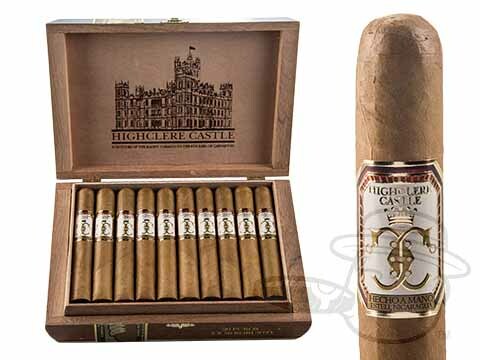 From Foundation Cigars, makers of the 92-rated Wiseman Maduro, Highclere Castle cigars were created by former Drew Estate blend-smith Nicholas Melillo to pay tribute to the fine handmades enjoyed at the historic English castle during the 19th and early 20th centuries. Smooth and flavorful Connecticut Shade wrappers over a dark Brazilian binder, Criollo and Corojo tobaccos from the volcanic soils of the Jalapa Valley, and an exclusive hybrid varietal known as Nicadán. The resulting smoke is exceptionally creamy and elegant, bursting with tones of pepper, citrus, leather and fireplace.